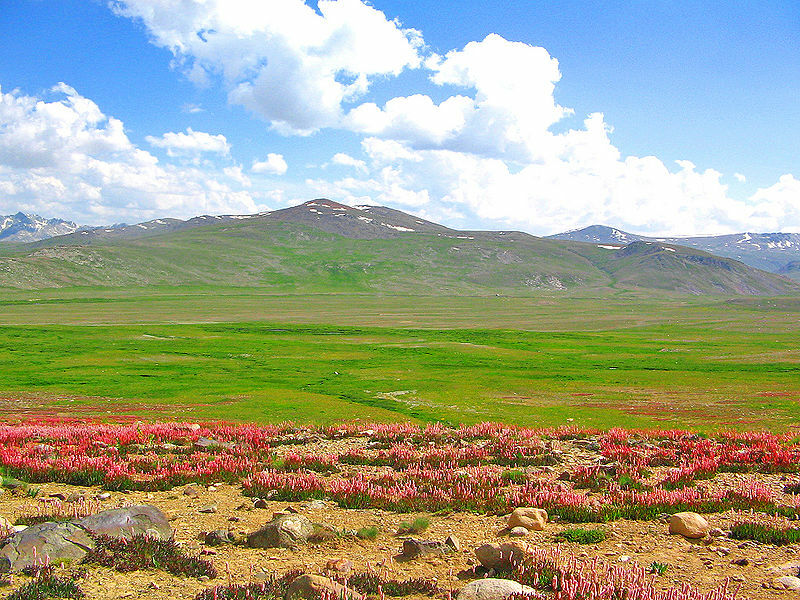 The Deosai National Park, in Deosai Plateau, is a beautiful summer pasture with greenery and countless species of Fiona flora. 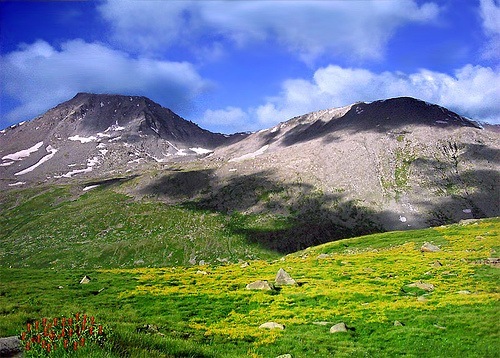 Deosai means the "Land of Giants". The True beauty of Himalayas is visible everywhere around Deosai. The view of the Karakorum Range from the top of the 4785 meter pass is legendary. In the Spring season it is covered by sweeps wildflowers and a wide variety of butterflies. Deosai Plains are a backwoods country at about 30 kilometres from Skardu. 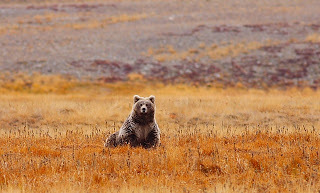 The Deosai National Park was established in 1993 to protect the survival of the Himalayan Brown Bear. This plateau is the habitat of the greatly threatened Himalayan Brown Bear and many other wild animals. Although few people will see a bear, quite a few are said to make their homes in the heart of the plateau. Fewer than 19 bears lived there in 90's and now the population is on the increase. Now nearly 55 brown bear lives in Deosai. Deosai officially is a National Park and protected area for wildlife. The undulating meadows here have no trees or shrubs and are snow covered for most parts of the year. Spring comes to Deosai late when millions of wild flowers begin to bloom all over the lush green grassland. 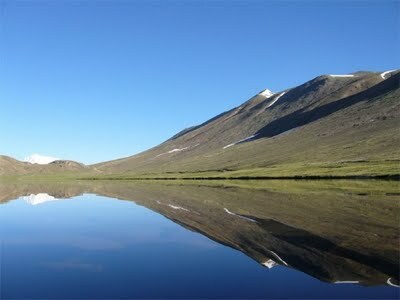 This is a time when Deosai looks like a fairies land with a landscape full of wild flowers on green rolling hills and crystal clear water streams with snow covered peaks in the background. 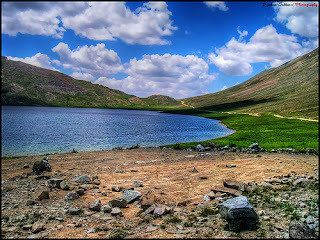 Deosai Lake, or Sheosar Lake is in the park. The lake, at an elevation of 4,142 metres (13,589 ft), is one of the highest lakes in the world. Its length is 2.3 metres (7.5 ft), width 1.8 metres (5.9 ft) and average depth 40 metres (130 ft). It is located near the Chilim Valley on the Deosai Plains. The area is surrounded by snowy mountains exceeding 5,000 meters in height and suspended glaciers. In June one can see full blooms of purple meadow cranesbills (geranium pretense), which cover all the slopes, mauve flowers of eritrichium the densely tufted knotweed (bistorta affinis) in a sheet of dark red flowers, a line of yellow flowers of pedicularis and many more in thick clumps. The Deosai Plains and Deosai National Park can be accessed via two routes. One is through Skardu City and the second through Astore District .The road from Astore starts from Chilum, continues through the plains and is asphalt road till the main lake before climbing to Deosai. The route from Skardu is via an unpaved road which can be hiked in two days. By jeep it is only a matter of hours. Deosai Bridge in the picture left. The Deosai Plains are also home to the Himalayan Ibex, Red Fox, Golden Marmot, Gray Wolf, the Ladakh Urial, the Snow Leopard, and over 124 resident and migratory birds. Birds in the park include the Golden Eagle, Lammergeyer, Griffon Vulture, Lager Falcon, Peregrine Falcon, Kestrel, Sparrow hawk and Snowcock. Research by the French ethnologist Michel Peissel makes a claim that the story of 'Gold-digging ants' reported by the Greek historian Herodotus, who lived in the 5th century BC, was founded on the golden Himalayan Marmot of the Deosai plateau and the habit of local tribes such as the Minaro to collect the gold dust excavated from their burrows. 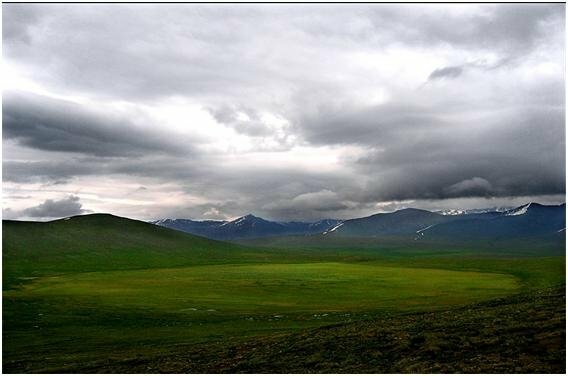 The documentary film series Land of the Tiger, in episode 5 - the "Mountains of the Gods," features the plants and animals of Deosai. Wow, what a beauty... Amazing!! Nice post. 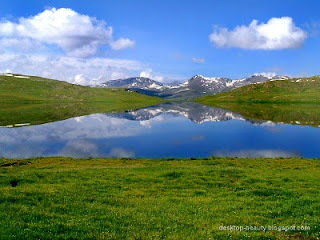 I have also written about Deosai National Park at my blog. I was googling about Deosai and came across your blog. Nice info.